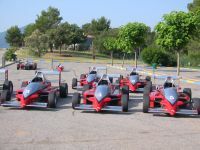 Last year I saw something on tv about riding a Formula 1 car in France. Great, I thought, but probably way too expensive. 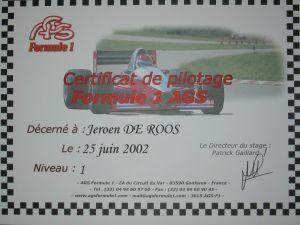 This year I saw the url on the Internet of the company that gave F1 courses: www.agsformule1.com. I didn't find the prices exorbitant high, so, being the speed freak I am, I booked for the course on June 25. 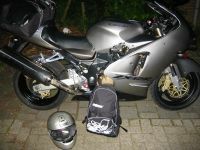 On Sunday the 23rd of June I left for France: a trip of 1300km. 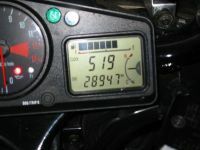 I traveled mostly with speeds between 160 and 200kmh. The downside of this was that I had to refuel a lot of times. Happily along the toll roads in France there are a lot of gas stations. While getting further south it got hotter and hotter. In the morning in Belgium temps were around 15 degrees Celcius, in France they got above the 30! 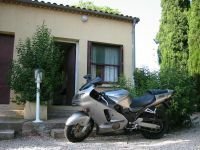 After 11 hours I reached my destination, the hotel Le Mas Du Four in a place called Le Cannet Des Maures. There I could cool down in the swimming pool. The next day I decided to have a look at the surroundings. First I tried to find the circuit I had to be on on tuesday. With the explanation of its location from AGS and with a good map I could find it easily. In the neighbourhood of Le Cannet are some great curvy roads, and I followed some of them with my 12. 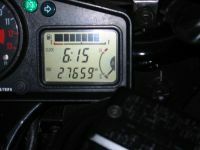 The temperatures were still high (more than 30 degrees Celcius), but the bike didn't have too much trouble with it. Unlike its owner: I had to drink a lot (of water) in order to keep my percentage of moisture up. Due to the heat I lost concentration once and almost collided with an oncoming car that suddenly came around a bend. He broke hard, and I could only just avoid him, coming to a stop on the verge of the road. The driver of the car waved to me and I waved back to show that I was alright, and we pursued our way. 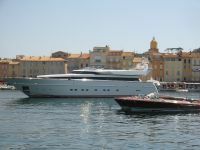 Only 30km from Le Cannet lies St. Tropez: with insanly big pleasure boats in the harbour and with some nice streets and squares a place sure worth a visit. June 25: the big day! 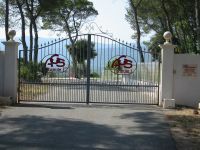 At 7:45h I entered the gate of AGS at Le Circuit Du Var. After changing into a race coverall with shoes to match, we got instructions about riding a Formula 3 car. Something about braking and changing gears. When changing gears down you should blip the throttle, and use the clutch and brake pedals. With only two feet. This sounded difficult to me, as it turned out to be. 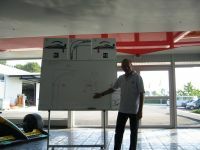 After the theory we could practice it with a Formula 3 car during 20 laps. We made stints of about 5 laps each time. In between we got some advice about our riding style. Shifting the gear down was not easy. Most of the times I already was around the corner before I could find the right gear. After lunch we got some more theory. 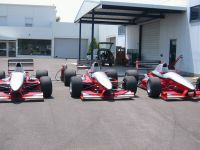 This time about riding a Formula 1 car. Braking and shifting gears was about the same as the Formula 3. Only this time we had 600hp in stead of 180 to play around with. 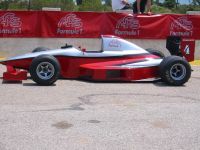 I was the first that could go on the track with the F1. After trying the gears with the engine off I was ready to give it a go. I switched the ignition on and signalled the guy with the engine starter that he could start the engine (no start motor in a F1). Now I had to increase the revvs and keep it high, after which I could, slowly, release the clutch. Slowly, but surely, the car moved forward. Yes! I left without stalling it. Alone on the track I concentrated mainly on the down shifting problem. Each corner was a challenge... On the two straights I accelerated as hard as I dared, making sure I didn't spin it, because than it would all be over. I found the acceleration comparable to the ZX-12R. At last, I thought, I drive a car that would be able to keep up with my bike. Braking was something completely different. With cones they had indicated where we should start to brake. Each time when I did this I would come to a stop way before the corner, so powerfull were those carbon fiber brakes. Steering was a delight too, very precise and more easy than I would have thought. 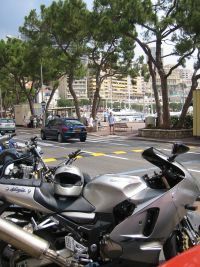 Wednesday the 26 I visited Monaco. I saw the famous places and some pieces of the F1 circuit. Thursday I left for the Netherlands. Again almost exactly after 11 hours I was back home. The bolt of the subframe I lost once got loose twice during this holiday. The second time I did not fasten it again (because the right tool was somewhere underneath all my luggage), but instead I removed it. I did lose another bolt though: one of the bolts that keeps the battery cover in its place. Looking for other things to do during your holiday?